The making of: Linn Sondek LP12 | What Hi-Fi? Perhaps only the vegetables on Hugh Fearnley-Whittingstall’s dinner plate have as much right to be labelled ‘homegrown’ as Linn’s hi-fi products do. Since 1973, the Scottish company has designed, made and assembled a catalogue of products – from turntables to active speakers to music streamers – in its factory located on the outskirts of Glasgow. Back then, 45 years ago, founder Ivor Tiefenbrun (now the company’s Chairman of the Board) paved the way for Linn’s ‘source-centric’ focus and created the brand’s first product: the now-legendary Sondek LP12 turntable. Arguably the most popular high-end turntable of all time in the UK, the LP12 has a reputation for being one of the finest (and priciest) turntables around, just one of the reasons for its inclusion in the What Hi-Fi? Hall of Fame. While the early breed of the LP12s sported a round and rich balance, modern incarnations have moved towards a more neutral balance. In April 2017, we commended the effortless musicality of the latest incarnation, the Linn Klimax LP12, noting that, “the old-timer’s still got it”. The fact that the Linn LP12 is still alive and kicking today probably has something to do with the fact the company has, over the last four decades, never stopped developing it. While Linn has dabbled with other (more affordable) belt-driven turntables in the past – the Axis (in 1985) and Basik (in 1989) – the Sondek LP12 has stood the test of time. That’s partly because it was designed to be modular, upgradeable and retro-fittable from the very beginning. The complete flagship Klimax LP12 (which sits above the entry-level Majik LP12 and middle-sitting Akurate LP12 versions), for example, comprises the Sondek deck, Ekos tonearm, 45rpm adapter, Kandid MC cartridge, Urika phono stage and Keel sub-chassis. Just about every aspect of the LP12’s design, from the bearing housing to the tonearm cable, the suspension to the power supply, has been constantly revised – to the point where there are almost too many changes to list. That’s mostly down to Linn’s continuous improvement… though it’s also partly because the LP12 has outlived some of the component suppliers. While recent sales of new turntables have been between 300 and 700 per year, Linn tells us the higher proportion of sales is attributed to upgrades. Owners can send their decades-old LP12 to the Linn factory to be upgraded to current day specification – yes, even those purchased over 40 years ago. While physical upgrades aren’t turned around every year, Linn says it is on a constant mission to improve the build and sound quality of the Sondek LP12. The decision to create a new upgrade often comes from the design engineers looking to improve a specific aspect of the turntable – but can also be driven by the needs and desires of its customers too. For example, the idea behind Linn’s top-grade cartridge, Kandid, arose from some LP12 owners using their Akiva cartridge without the body – hence the idea to make a lighter, housing-free cartridge, designed to reduce resonance. But it’s not just the components that have moved on; the manufacturing process has too. Ivor’s son Gilad Tiefenbrun, who now runs day-to-day operations, takes What Hi-Fi? for a guided tour around Linn’s factory, highlighting the company’s £1.1m investment in upgraded machinery across all aspects of production. As Linn’s flagship Klimax product range is produced from solid raw aluminium billets, a new five-axis metalwork machine has been brought in to more precisely manufacture the machined-from-solid Klimax casing to isolate power and analogue and digital electronics. Linn says new component placement machines also allow the use of smaller components on circuit boards than before, minimising the audio signal path between individual components, while new vapour-phase ovens have been installed to improve circuit board soldering accuracy. But the Sondek has the human touch, too – and three people are employed at Linn’s factory to carry out the tone arm testing. The process requires the patience of a saint, involving counting the number of lateral and vertical swings to ensure the tone arm is working properly. 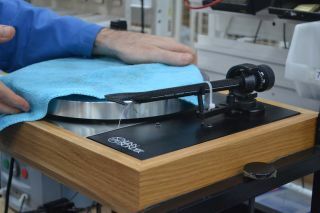 Once the components have been machined, Linn chooses to assemble the Sondek LP12 by hand, which takes just over an hour per deck and includes a series of tests taking place during each step, including checking the platter level and suspension, running a speed test, and testing the earth bond to ensure it can handle the current. But the coup de grace is saved for last, as the assembler signs their name on the finished deck. Once packaged, it’s sent upstairs to be shipped, leaving the factory by a door located around the corner from where the process began. Like the records it spins, the life of the Linn LP12 has just gone full circle.